House fire on East Diamond Ave. This evening, August 3, 2012 the Spokane Fire Department responded at 7:19 PM to 2720 E. Diamond Ave on a reported structure fire. Engine 15, stationed at Wellesley and Crestline arrived at the Diamond address within 3 minutes of being dispatched. Engine 15's officer reported smoke showing from a 1 ½ story home. Engine 15's officer gave tactical assignments to other responding fire companies and quickly attacked the fire. The home was searched and it was verified that the home's occupants were safely outside. The fire in this structure was brought under control within 10 minutes. Fire damage was confined to 1 bedroom with smoke damage to the upper floor. The fire cause was determined to be accidental overloading of electrical wiring. Six fire companies responded to this incident. There were no injuries. 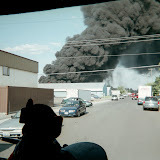 This morning, July 29, 2012 the Spokane Fire Department responded at approximately 7:56 AM to 5815 North Elgin on a reported structure fire. Fire crews responding to this incident report smoke showing from several blocks away. The first crew on-scene reported fire showing from 2 windows at the north east corner of a one-story, wood framed residence. Fire fighters aggressively attacked the fire from the interior of the structure. The fire had extended from the room of origin into a second bedroom and then the attic prior to extinguishment. The occupants of the house were home at the time of the fire and were able to escape through a kitchen door located on the south side of the home. There were no reported injuries to civilians or firefighters. 9 fire companies with 24 firefighters responded to this fire and were on scene for approximately 2 hours. The cause of the fire is was determined to be a child playing with a lit candle.